This was worked purely for my own entertainment, based on Jacobean motifs, and designed for our own living room. The colours were chosen to reflect those of the glazed tiles set into the fireplace. I've used sparkling threads, stranded cottons, mercerised cottons, pearl cottons, wools and chenille threads, some plain and some of them over-dyed. Often, as here, I use a lot of dyed threads from Stef Francis ( http://www.stef-francis.co.uk/ ) among others. Sometimes it is worth being very careful with over-dyed threads, but I have found that Stef's dyes don't run. The fabric is a plain and heavy cotton twill, unfinished (neither bleached nor glazed). 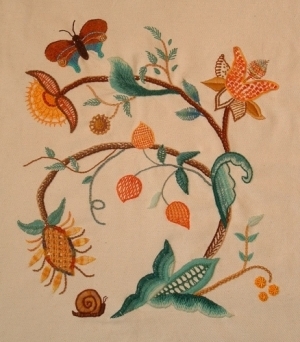 The stitches include spiders web stitches, cable chain (another favourite stitch), battlemented couching and a variety of more conventional stitches, such as satin stitch and blanket stitch, and their variations. I included a butterfly and a snail because the Jacobeans were fond of including animals and creepy-crawlies in their designs, and because I thought they would be fun to do! The piece is now mounted in a firescreen I found on eBay and kept in our sitting room, where it reminds me of the fun I had making it, every time I see it.